“Logging seems to be something you are born into. You never hear about someone quitting a stockholder gig to ‘live the life of a logger.” That’s a quote from Jerry Gray in an article for The Forestry Review, and it certainly holds true for him. Jerry Gray was born in 1961 into a logging family. His Great-Grandpa Thrift helped build a railroad into Billy’s Island in the Okefenokee Swamp. His Grandpa Thrift later logged and helped settle the swamp. His Dad, W.C. Gray, worked in the log woods, even logging out west for a time, and started his own logging company in 1971, when Jerry was just ten years old. Since that age, Jerry has “lived’ in the woods. At 13, he was using a chainsaw. At 15, he was driving a cable skidder. At 18, upon graduation, he was full-time in the woods. 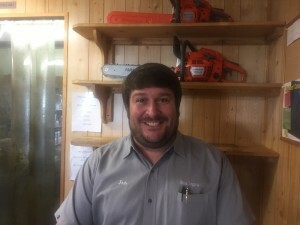 At the age of 40, he became the manager of Gray Logging, LLC. That was nearly 15 years ago. Today, Jerry still loves the woods as he did as a little boy. Combined with that love is knowledge, experience, and passion. W.C. Gray has always been an important element in Gray Logging, LLC. He began the company in 1971. His hard work paid off and he was able to officially retire in 2001. Although retired, he still contributes greatly to the business. 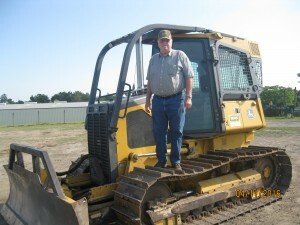 He has many duties, some of which are: getting parts to the woods crews, running the bulldozer to maintain logging roads on certain tracts, holding down the fort at the company’s shop, and giving valuable advice. When not working, he is at home aggravating his wife, Sylvia, of 55 years and spending time with his 4 grandchildren and 7 great-grandchildren. Josh Ensminger was born and raised in the foothills of Tennessee. 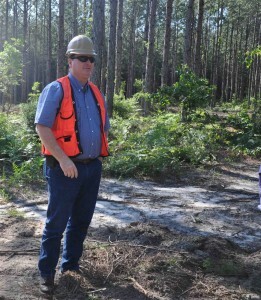 He ventured south to Florida in 2004 and has been a significant part of Gray Logging, LLC ever since. He is responsible for truck DOT compliance and maintenance, along with being shop supervisor. Because of his upbringing, Josh has a great love for the outdoors and a desire for others to understand the relationship between man and nature and the necessity for utilization. Hence, helping others understand the importance of timber harvesting, the value of the everyday products which are made from wood that we often take for granted, and the importance of our company within the community. Josh is happily married to Elizabeth and they have two adorable children, Emmalin and Caleum. They are members of the Azalea Church of God in Valdosta, GA where Josh enjoys playing on the church’s softball team. By the same token, we’ve all heard countless tales of the second or third generation of logging family selling out to pursue other interests. Imagine, then, a modern, thriving logging operation that can trace its roots back to the late-19th century. A family that has been logging continuously for over a century. Jerry is recounting his family’s history in W.C.’s Kitchen, a kitchen that doubles as a break room attached to the office and shop of his company. Ginger is seated next to him, while his father, W.C., the kitchen’s namesake and Gray patriarch, sits at the nearby breakfast bar. Although W.C. is retired a decade ago, he is still a daily fixture at the shop. Jerry continues, “Grandpa Gray told me that his grandpa, or great-grandpa, used to hew cross-ties out with broadaxes back when they hauled them out with oxen. This was around 1880-1890 – they were building the railroads.” Railroads into the Okefenokee Swamp. “I’ve been told that Grandpa Thrift, my mom’s father, logged and helped settle the Okefenokee Swamp. My Great-Grandpa Thrift helped build a railroad into Billy’s Island – I don’t know if y’all are familiar with Bill’s Island. It was a big settlement. Once back in Georgia, W.C. and James kept an eye out for other work. “We got called down here, to Perry, Florida,” W.C. tells us. 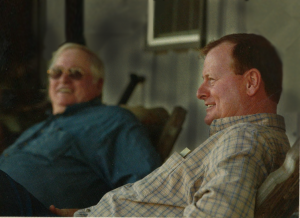 “A lumber company that owned about 100,000 acres in this area hired us, and we moved. We logged with them about 19 years. “We moved to Madison in ’69, then James and I broke up our partnership,” W.C. explains. By the start of the next decade he was ready for a change. “I woke up one morning and knew I wanted to do something myself,” W.C. recalls. “In ’71, I went to a local dealership, and they had some stuff they had taken from an old boy – it was wore out. I don’t know how I did it, but I took all of it on a $300-a-month lease.” W.C. is grinning while he talks, looking both proud and amazed at this less-than-auspicious start. “I’d go out every morning with the saw and cut down 40, 45 trees. I had to limb them, drag them to the ramp, and retop them. Then, I’d put a load on the truck and wrestle them up to the mill. I’d get back, and I’d cut a little bit more – when I’d get home, you didn’t have to rock me to sleep!” says W.C., followed by another chuckle. Although the Grays continue to face the day-today challenges most loggers face – like rising fuel prices and uncertain supply of wood – they do so by relying on a rich tradition to thrive. Ginger sums it up nicely, “It’s a family business. This is our life, it’s not just a job.